Carpool Buddies, Won’t You Chat? Sometimes I wonder what my relationship will be with my children when they get older. You know when poop isn’t their favorite word and ice cream doesn’t cure everything. Today’s guest today is with someone whose children are older than mine: my cousin Bonnie. She and her husband, Howard, have two children ages 16 and 13. She works as a resident coordinator in a large hospital in Philadelphia. Bonnie enjoys reading, baking and going to the movies. She also loves playing board games and recently became addicted to some I phone games. Bonnie was one of my first followers. Unfortunately, she rarely comments. However at every family function she tells me how much she enjoys the blog. Family is a good thing! This is her first blog post. Enjoy. Do you drive your kids to school? I do. I drive my teenage daughter and her friend to a school in center city Philadelphia that is 13.9 miles from our home. We are carpool buddies. Anyway, the girls sit in the back which leaves the front passenger seat available for my tote bag, pocketbook, box of tissues, and makeup. The three of us spend 45 minutes together every morning fighting traffic jams, pot holes and obnoxious drivers. We have lots of time to talk, listen to the radio…. etc. This has been our routine for 5 years. A few years ago we carpool buddies found a radio station that we all liked. We used to sing along, listen to the gossip about Hollywood stars, and try to call in for trivia contests and concert tickets. Unfortunately, some DJs left and the ones who remained became increasingly annoying. We no longer enjoyed the “talk” and the music become very repetitive. The girls’ response was to plug into their personal audio devices (Ipods). I was left to listen to the news or an “old lady radio station” with light rock/easy listening. I missed the old days when I felt we were carpool buddies. I missed their animated conversations about who likes whom or what teacher did what. I missed hearing about the parties they might attend and the outfits they might wear. They may not have always been including me, but I felt like I was part of it, and felt privileged to have that window into their lives. Sometimes we still have great conversations, or my daughter will read out loud to us. Yet now, more often than not, there is silence in the car. The girls are either sleeping or studying quietly, and I don’t want to disturb them. You should see them. They are bent over writing, reading, calculating or memorizing. Otherwise, they are reclining in their seats, snuggled under a blanket and out like a light. However, I treasure these early mornings. I love having my carpool buddies. Before I know it, my kids will be driving themselves and will have no need for me in the driver’s seat. Hmmm…It’s not a bad idea. Maybe next year they will be in the front, and I will be sleeping in the back with my tote bag, tissues, cellphone and other essentials!! ***For those of you visiting Me Myself and Kids for the first time, feel free to have a look around. You’ll find posts focusing on family, current events, and education. 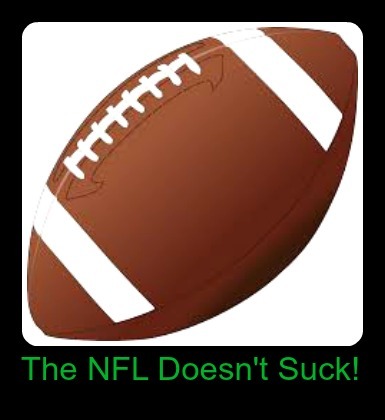 If you’d like to follow the site via Facebook, click here. If you would like to get posts delivered directly to your email, click here and look on the right for subscriber information. Thanks again for stopping by and sharing this amazing story of Anny’s courage and R.S.’ overwhelming love and pride for her daughter. Everyone knows the saying if life gives you lemons, then make lemonade. Some people live their life with this mantra. One such person is the daughter of my dear friends. R.S. is a crazy New Jersey mother of two children – a son aged 17 and a daughter aged 12. RS works primarily to pay for expenses incurred in educating her visually impaired daughter. In addition, she tries to manage her household. Below is a story about R.S.’s12 year old Anny that is sure to bring tears to your eyes. Thanks to R.S. for sharing this incredible moment. My visually impaired cancer patient 12 year old daughter can do anything she wants. Recently, she decided to raise money for the charity Chai Lifeline (an organization the supports children with cancer and other blood disorders) as a way to say thank you for all the support they have given her during her battle with cancer. 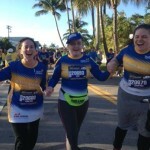 So, she decided to participate in the organization’s Miami half marathon. 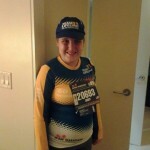 Anny dressed and ready to head to the marathon. We flew to Miami Thursday night but didn’t check into our hotel till 2:30am! From the time we woke up the next day, we were being taken care of without even asking for it! Anny spent Friday afternoon swimming in the pool and enjoying spending time with some of the other kids who were there – cancer patients, survivors and siblings of patients. Lunch was brought by one of the counselors who made a pizza run. Dinner was provided by Chai Lifeline and over 700 people shared that meal. We were sitting with our group – The Power Players – Anny’s counselors from camp – who raised almost $50,000 to participate in this marathon! There was singing, and joking and good food. I watched as Anny’s counselors included her in the singing and even joined Anny when she chose “The cup song” (her favorite) to sing! Later, I enjoyed the dessert reception by one of the hotel pools while Anny was resting in the room, too tired to go. I spent some time talking to other families of cancer patients and survivors about life. I needed this time as my husband and I had just gotten news: Anny’s first MRI after chemo showed unfavorable results. We talked about anger, frustration and the brief meltdown Anny had earlier in the evening when I told her about the MRI. I had told Anny that it was ok to cry, after all this was not what we were expecting to hear. Saturday’s weather was even more beautiful than Friday. The sun was shining brightly and we decided that we were going to walk along the beach with some other girls after lunch. Saturday night was a pre-race past party. Everyone who entered the party was cheered on by the staff – The cheers of “Anny, Anny, Anny” were a great start. The room was filled with runners, some in their team shirts, some in their running shirts, and some in just their normal street clothing (Florida style!) There were some speeches, some videos and lots of cheering and yelling and singing. We got up at 3:30 A.M. as we needed to so to catch a bus to the marathon at 4:30 A.M. Anny wore her shirt with the marathon badge. 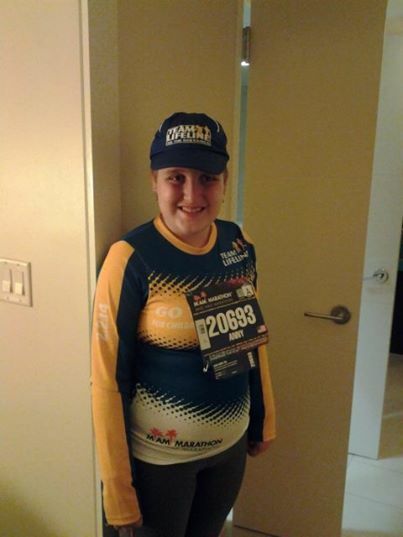 I was so proud to see her in her marathon outfit – sneakers, runner’s pants and marathon shirt with her number and name on the sleeve! Anny at the starting line. 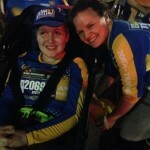 Once at the race, I found a good seat at the finish line anxious to see my princess to arrive. 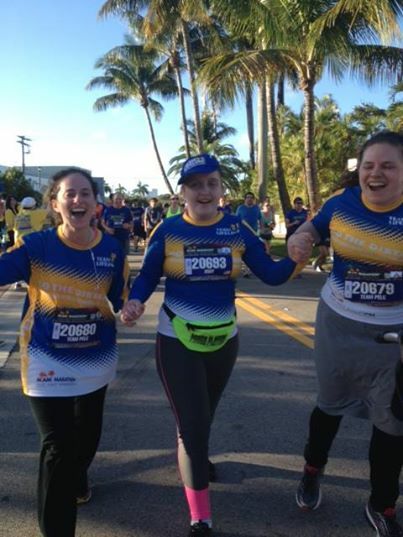 I was told that my daughter’s counselor usually ran the marathon in just over three hours, and she predicted that it might take her 30 minutes longer to push. Anny and her counselors along the route. At 4 hours and 28 minutes, I saw a beautiful sight. 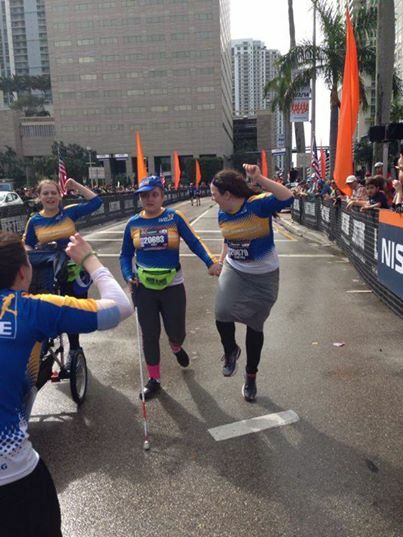 There was my daughter, smiling, walking with her cane, guided by her counselor, with another counselor pushing the wheelchair, walking towards the finish line. I began to scream and cheer and cry. 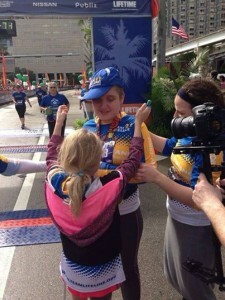 I could not believe that my daughter – with brain tumors in her head, and a walking cane to guide her in her hand – was about to cross the finish line! 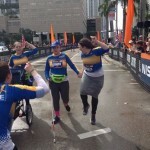 Other runners joined her as she approached the finish line and crossed it with her. They sang, screamed, and cheered with her and me. Anny and her counselor crossing the finish line. My daughter who is “differently abled” can accomplish anything! Seeing my daughter cross that finish line filled me with a feeling that words can’t describe and an image which I will never forget. Annie getting her medal from another counselor. Anny faces many challenges, in the next few months while we get clarification of her updated diagnosis and in her life as a whole – but she can do anything she wants to. 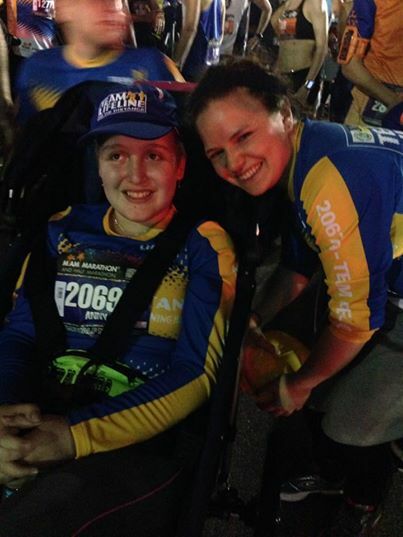 **Please note Anny walked three miles of the marathon and was pushed in a wheelchair for the other 10.5.